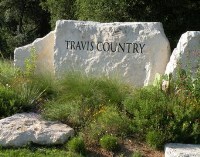 Spacious home on tree-lined greenbelt lot in desirable Travis Country. Pecan wood floors, travertine tile in kitchen, den & entry, custom fireplace mantle, huge upstairs bonus room, corian-style kitchen counters, wood staircase and ballisters, recessed lighting, and sprinkler system. True "mother-in-law" plan with one master bedroom upstairs and one downstairs. Family-friendly neighborhood features abundant parks, pools, and hike and bike trails. Pre-inspection available online.